UDM Downloads > Xilisoft DVD to PSP Suite! Xilisoft DVD to PSP Suite is an easy-to-use DVD to PSP movie converter tool which can rip DVD and other video formats to Sony PSP MP4 format with perfect quality and fast conversion speed. It includes two products, Xilisoft DVD to PSP Converter and Xilisoft PSP Video Converter. 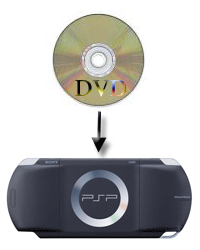 With Xilisoft DVD to PSP Converter, you can use it to easily rip DVD to PSP MP4. And Xilisoft PSP Video Converter can help you to convert various formats including AVI, MPEG, WMV, MPEG1/2/4 to Sony PSP MP4 with perfect quality. Furthermore, It can convert popular audio formats like WMA, AAC, M4A, AC3, OGG, etc to PSP audio MP3. 1. Xilisoft DVD to PSP Suite supports multi-threading, you can convert multiple files at the same time, as well as 15 and 29.97 frame rate; 2. The video size for Sony PSP: 160x112, 324x248 and 368x208 is adjustable; 3. It supports Bit Rate from 216 to 1500 Kbps; 4. It supports converting any clip or segment of DVD movie or video files: you can choose start point and duration at will; 5. With PSP Video Manager integrated with Xilisoft PSP Video Converter, you can easily move PSP MP4 files to your PSP after your converting. 6. Xilisoft PSP Video Converter has been upgraded to v3.0, a large number of new features have been added. For example, it supports H.264/PSP AVC encoding/decoding, APE and CUE decoding, audio CD ripping, and the wizard was added. Zoom and split functions were added. Visit xilisoft.com to know more. With powerful functions, fast ripping and converting speed, excellent output quality, and all built-in encoders and decoders, Xilisoft DVD to PSP Suite is recommended as a perfect product worthy of trying. And with our prompt and effectual support service, you can be unhesitating to let us know if you have any questions about us and our products. Just download this excellent product and enjoy you movie on your PSP right now!